Top business pages on Facebook like Tech Insider, NowThis, Buzzfeed, Tasty, etc., use explainer videos as a way to market their content to their target audience. While they have set new benchmarks with a tonne of likes every single day, other similar platforms juggle hard to reach that level and spend a huge amount of money to attract viewers. As technology is expanding at the faster pace than ever before with new software or tools hitting the market every day to boost online presence, companies have become skeptical of choosing the tools that can actually generate the results they aspire for. A video graphics presentation of an idea, product or service with the goal to attract the target audience and generate new prospects. By inculcating engaging graphic elements while illustrating those graphics through meaningful content, organizations take advantage of explainer videos to establish their brands online. 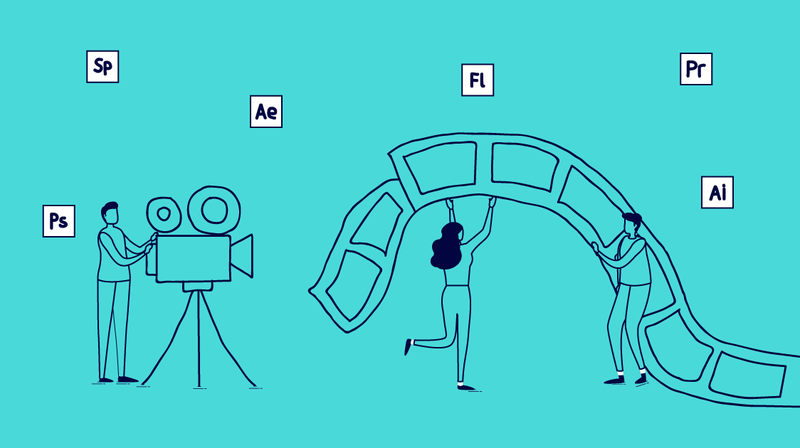 Probably anyone can bet on the quality of Adobe After Effects, developed by Adobe Systems when compared with other software as Adobe is used to create professional video explainers. Through Adobe AE software, graphics experts are able to design and produce highly engaging graphics motion videos. As its terminologies are a bit complex, beginners might need to learn about this tool, in the beginning, to get hands-on it. It is not recommended to use it as the primary tool to make videos for marketing campaigns unless you have an expert to use this complex tool. The two things that have taken social media to the next level are the mobile industry which has streamlined web surfing and explainer videos which have become an integral part of any marketing strategy. A device friendly explainer video that is optimized for autoplay, vertical and sound-off viewing functionalities can make a difference in developed a recognized online presence. Let a number of eyes look at your product and services through video explainers while pasting them on social media sites. This cloud-based tool helps in creating scalable videos faster. Being embedded with all the features required to create an engaging video, video makers usually use this feature to turn any idea into a video in a matter of minutes. If beautiful typography, images, and brand layouts are what you prefer, then Typito is the right choice which is a web-based drag-and-drop tool to create video explainers. Since the day of its launch to the present date, this tool has gone through a number of upgrades which make it one of the favorite video making tools. You can easily put in interesting motion graphic text, which otherwise you have had to do through a desktop based program which is not easy. With the drag and drop interface, this tool is easy-to-use animation software. It has an archive of templates, graphics libraries, animated charts, etc. which make it a great tool for creating a video. Moreover, it allows recording sound explanations. Renderforest makes the video creation process simple and scalable. Now, create different types of videos using your browser without installing any software. With a big pool of pre-made video explainer templates, this tool helps video makers to create engaging videos in no time. A professional look and feel are important to engage a viewer to the end. It is a cloud-based software which is perfect to create animated presentations and videos. Image-based vignettes with texts and music are trending these days. Creating them is not easy as they require creative skills, time, and sophisticated software. Using this tool will give you access to millions of premium video clips along with the latest music. Being a video editing application, it allows users to create intuitive and inspirational marketing video memes. It has four steps: upload a video, clip the magical moment, select a template, and add your caption. TopVid is a Facebook video ad builder which helps people to promote their product on social media in the best way. With a variety of templates, video makers can construct product showcase videos at a minimal cost. Want to optimize marketing videos for mobile devices? Go for Crop.video! It uses smart technology based on Open Computer Vision. The uploading of video results in splitting of it into shots which further gives you suggestions for cropping depending on object recognition and face. Moreover, users can easily add a logo, trim videos and subtitles.